Steel cut oats are delicious and satisfying, but can take more time than I want to spend each morning cooking. Soaking the oats overnight significantly reduces their cook time, allowing this recipe to be a staple in my home. I mix it up by adding different nut or seed butters plus dried fruits such as apricots or juice-sweetened cranberries. And often, I double the recipe to make sure I have leftovers that can be reheated even more quickly another morning. 1Place oats in pot with water and soak 6 hours or overnight. 2Place pot with oats over high heat and bring to boil. 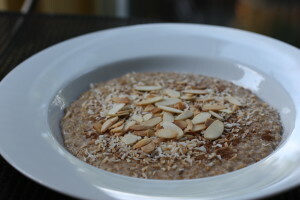 Reduce heat to low and simmer until oats are creamy (20-25 minutes). 3Remove from heat and stir in almond butter and coconut milk. Top each serving with a dash of ume plum vinegar, ¼ teaspoon cinnamon, 1 tablespoon coconut and 1 tablespoon sliced almonds. NOTE: For those with an allergy to tree nuts, sunflower butter is a delicious substitute for the almond butter.